Our guide from Naturalist Science and Tourism picked us up and we drove to the dock. 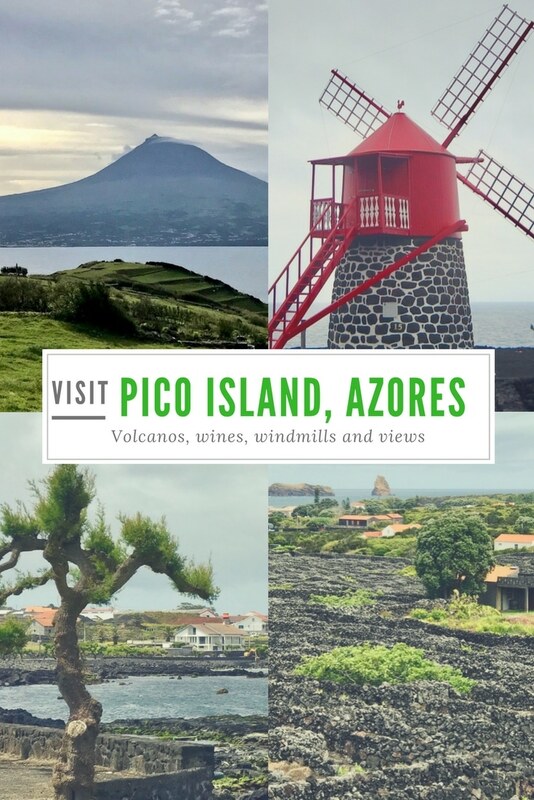 Pedro provided us with a great tour of Faial Island and we were excited to get a historical perspective of Pico Island next. Pedro stayed with the car while we went into the new marine terminal. There were a lot of people waiting for the ferry to Madalena on Pico Island. But nowhere near the number of people who were on our return ferry from Pico. 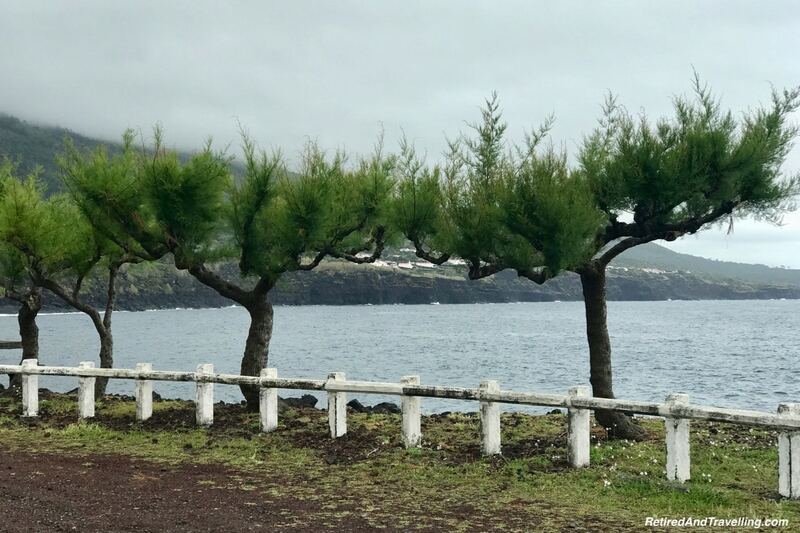 The weather for Faial looked like rain but Pedro said the weather could be very different on Pico. 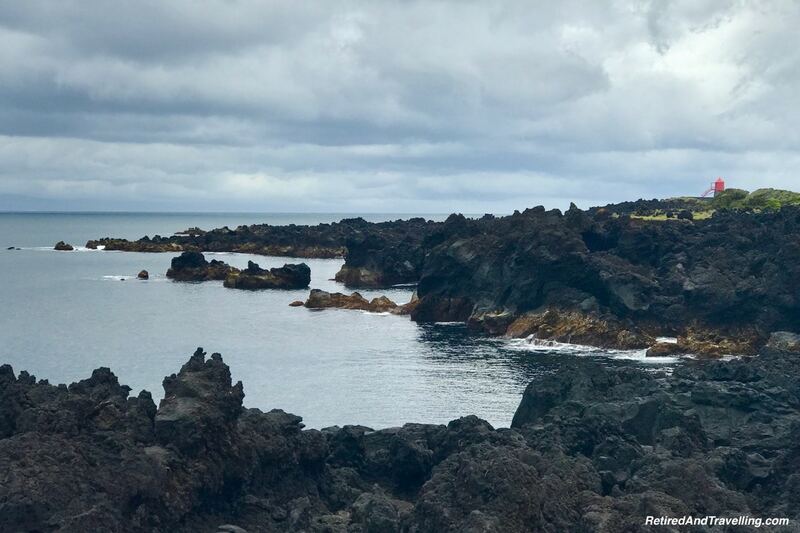 Pedro had a full day planned for us to get a good introduction to Pico Island. 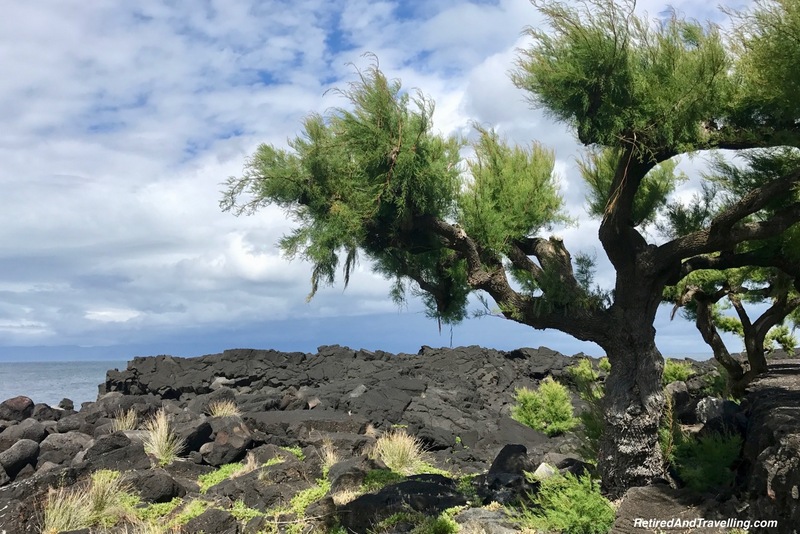 We got a view of many different kinds of volcanic activity, a look at the resurgence of the wine industry and a better understanding of the whaling history of Pico. As we set out, we saw that Pico Mountain was again covered. Throughout the day the clouds moved lower. 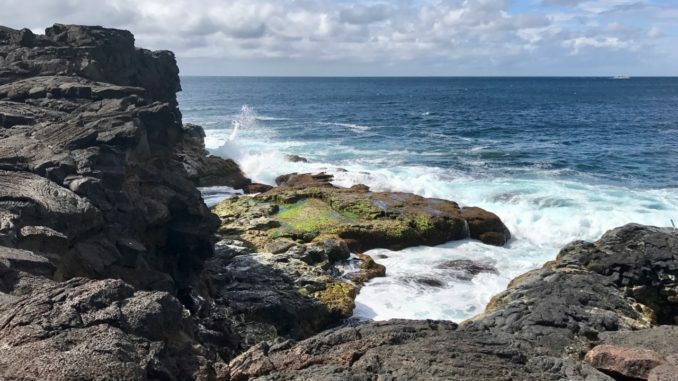 We would not see the peak on this day trip to Pico Island. It was a fast trip (<30 minutes) on the ferry. 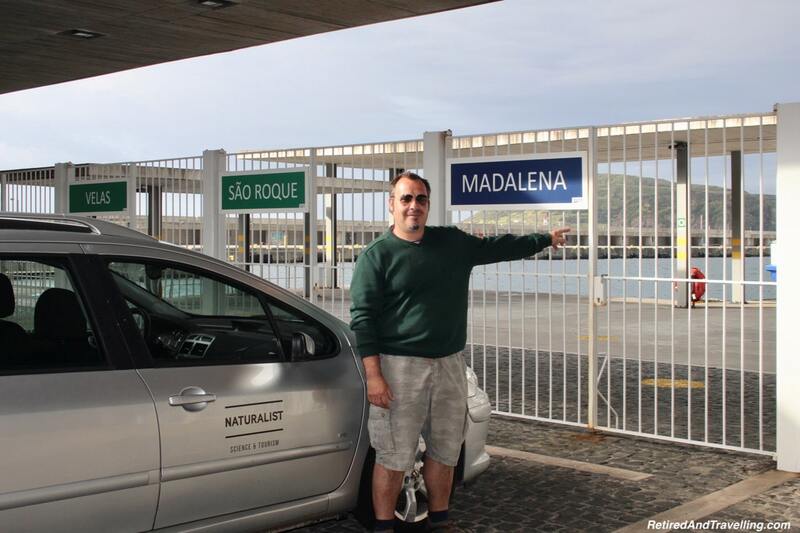 The ferry from Faial arrived in the small town of Madalena. 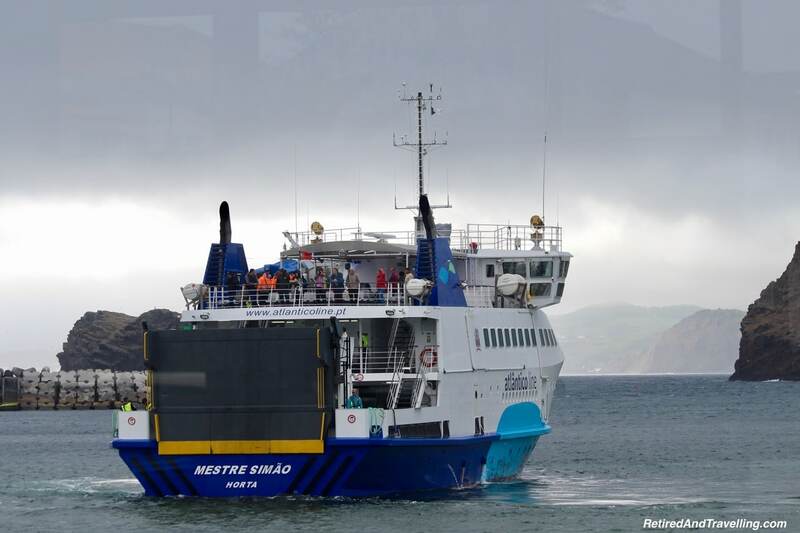 In May the ferries were not yet on a summer schedule so we had to plan our trip around the ferry schedule. The ferry docked in Madalena. We exited the marine terminal and immediately saw the stores set up for both scuba diving and whale watching. Small cafes were around the dock area. 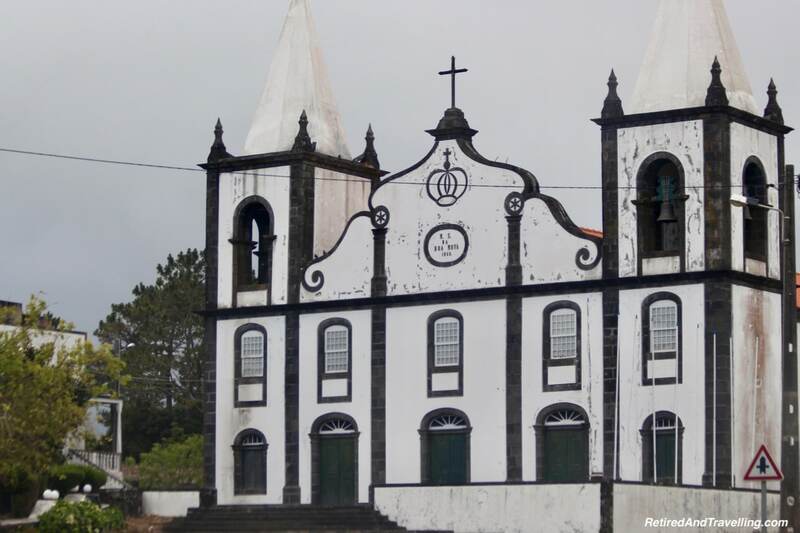 There was a traditional Portuguese church in the small town square. 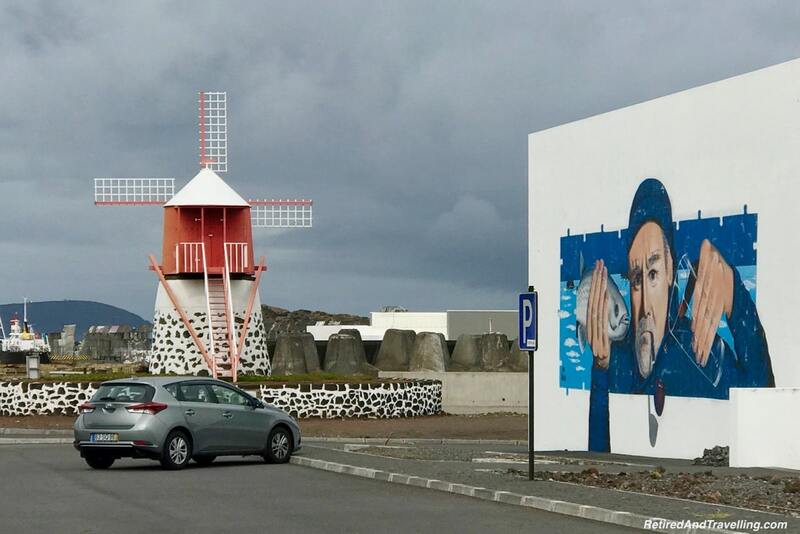 As we drove out of town we stopped a few times to look at interesting street art. 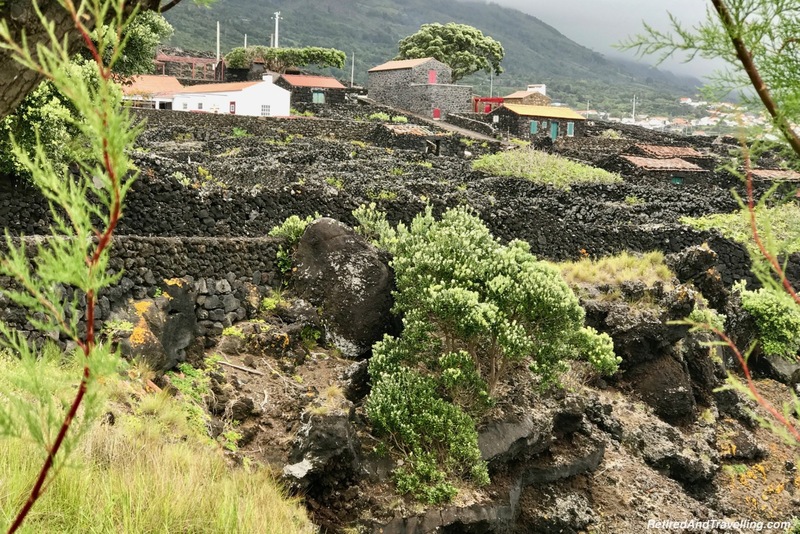 As we travelled around, we often found other examples of that showed the historical perspective of Pico Island. 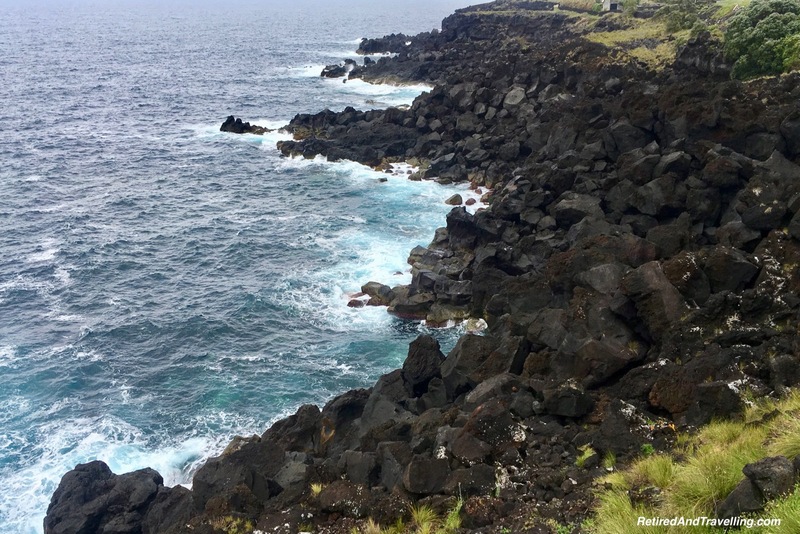 Volcanic activity was one side of Pico Island we explored on our tour. 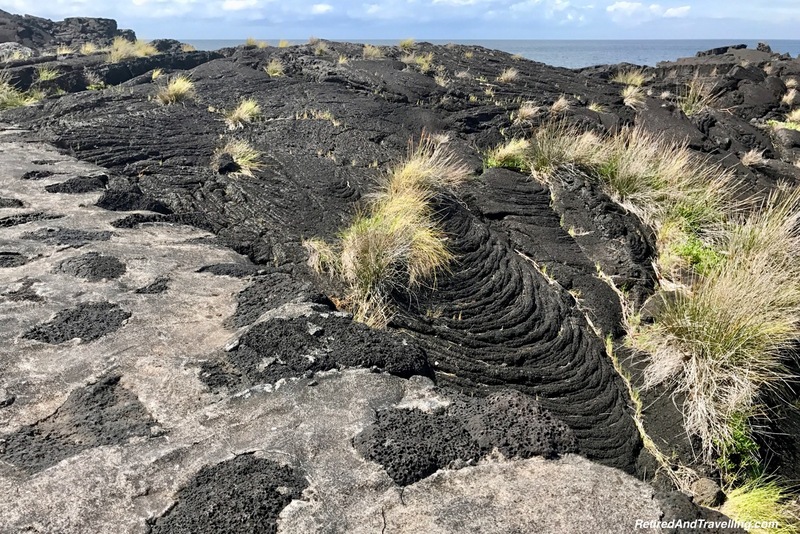 We stopped many times to look at different types of lave flows on this island. On our first stop we saw the flat lava flow. Pedro took the opportunity to show us different local flowers and herbs. As we travelled with a biologist we got another interesting facet of the historical perspective of Pico . 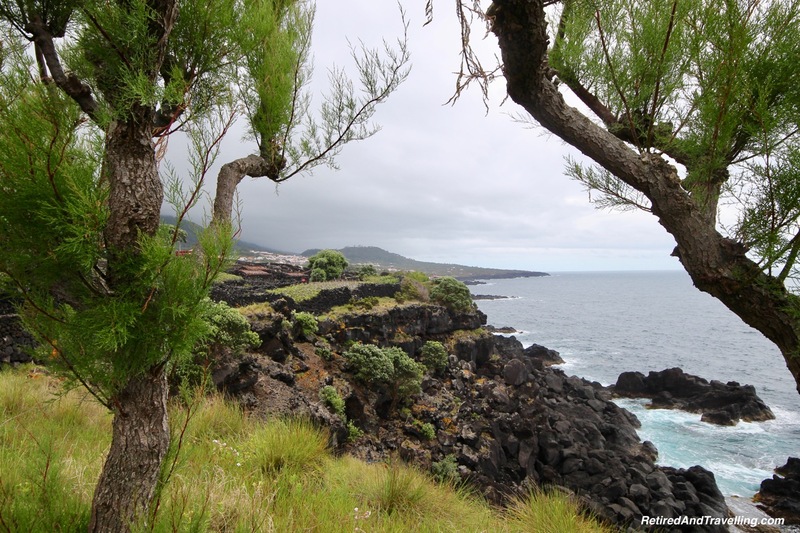 We looked at the overgrown fields and the very distinctive trees we saw all over Pico Island. 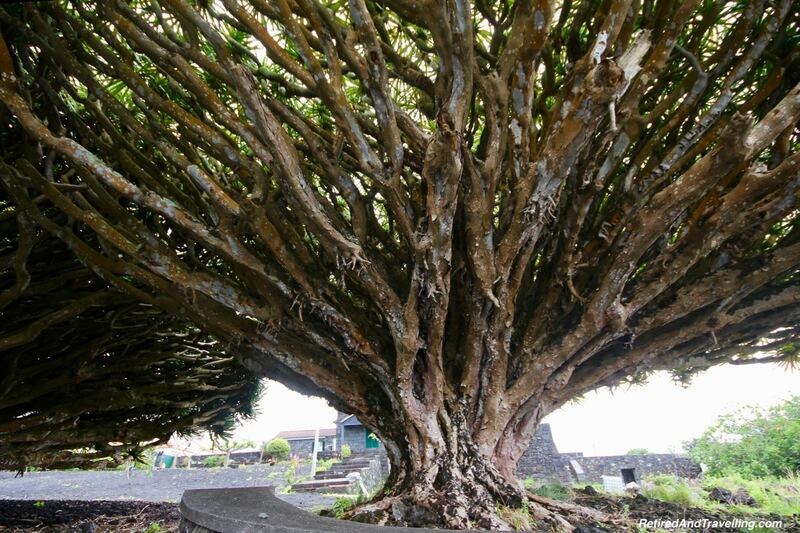 Several times on our tours of the islands we stopped to look at a dragon tree. 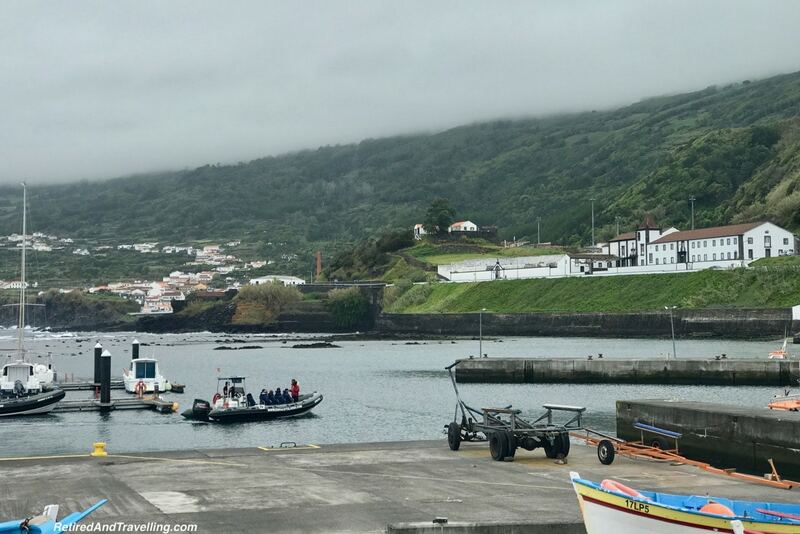 We saw small ones on Faial and a few much bigger on Pico. When we visited the Canary Island of Tenerife we saw a giant one in the botanical garden. The tree produced first a flower spike with white, lily-like perfumed flowers and then gets coral berries. We never did see a dragon tree in bloom. The tree’s red sap (known as Dragon’s blood) has a number of traditional medical uses. As we travelled, we got our first view of the small wine fields. Rock walls were used as wind breaks. These were very different than the semi-circular wind breaks we saw on Lanzarote in the Canary Islands. We parked and walked thru the cute little village of Cachorro. It was interesting to get a close look at the traditional buildings. 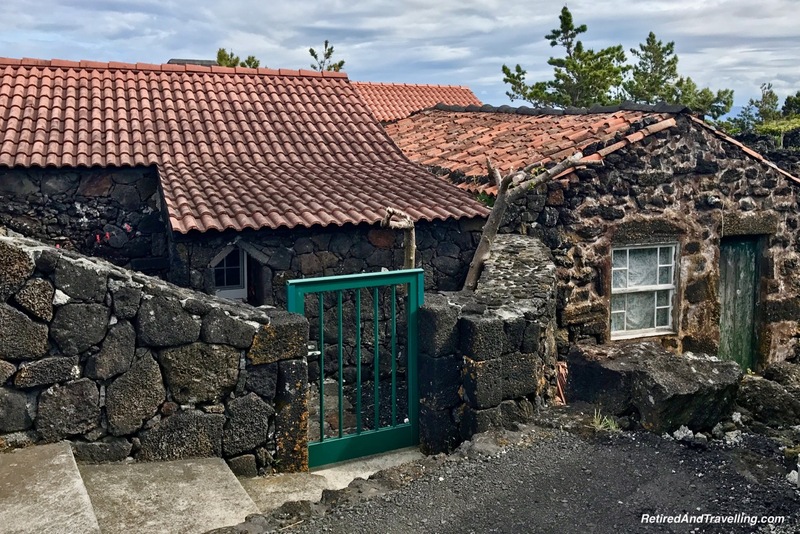 Many of the buildings on Pico had been fully restored, offering a great historical perspective of Pico Island from an architectural perspective. The little church was simple. This design was mirrored in other buildings. Unlike the flat lava we saw on our first stop, this lava was sharp and angular. 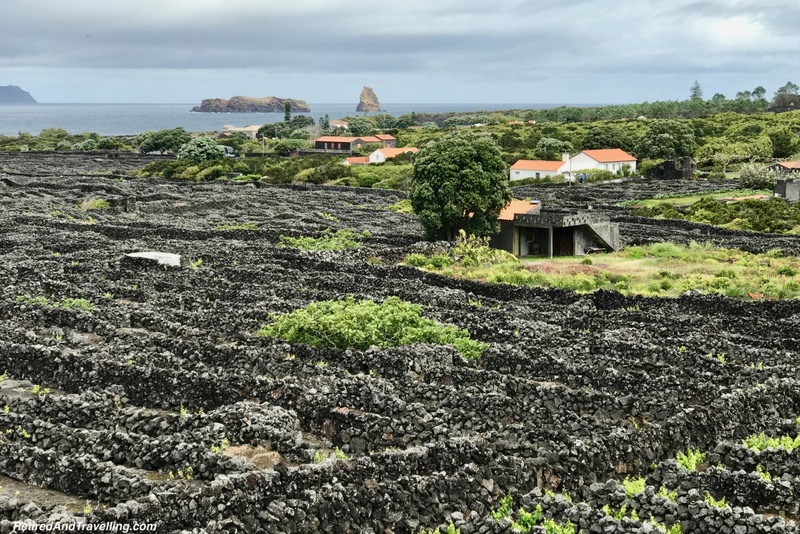 It was very much like the lava we saw in many places in Faial and when we explored the volcanic setting in Sao Miguel. There were pathways out over the lava field. Deep water channels caught the surf. There was a small artisan shop in the village. 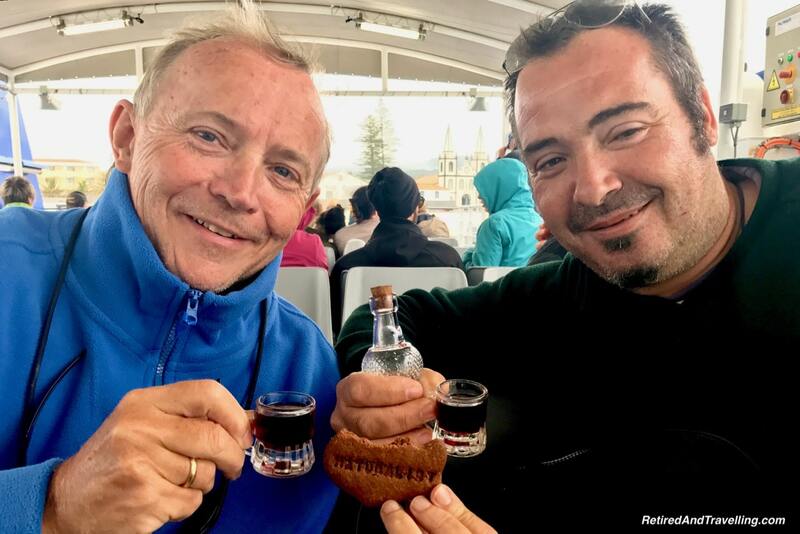 We stopped and sampled various liqueurs. Most made my eyes water. 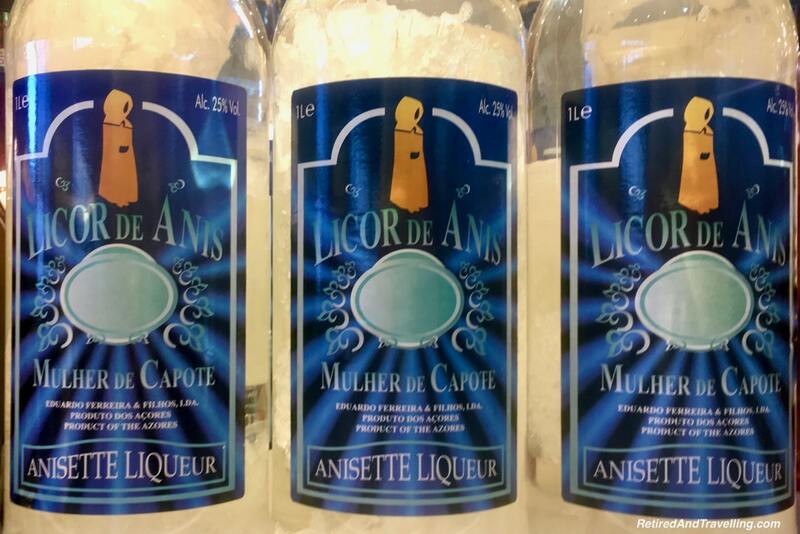 David bought a small bottle of Anise liqueur. He loved the taste of liquorice! Everything I tried was either too strong or super sweet. 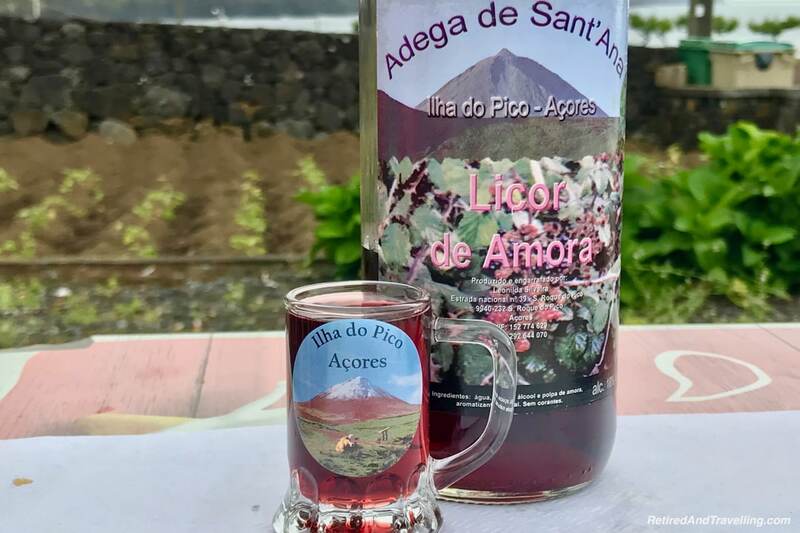 It was nothing like the homemade blackberry liqueur that I had come to love in the Azores. Our next stop was by the interesting Cella Bar. 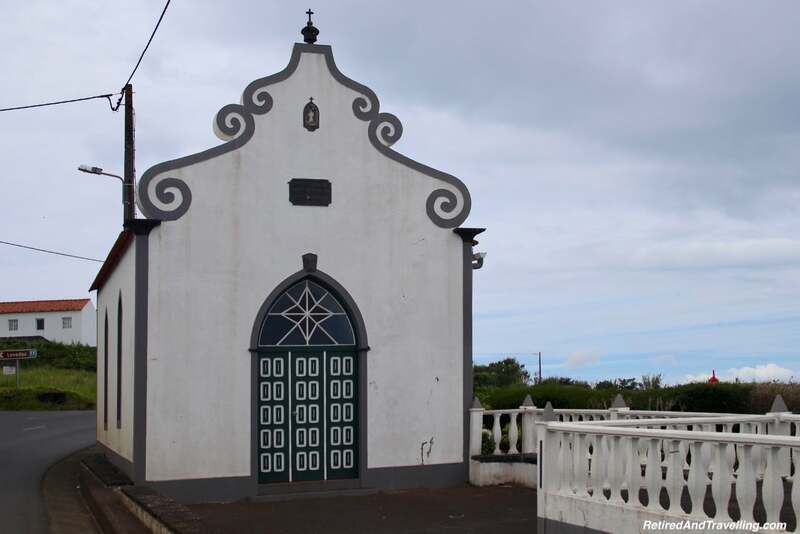 It had been damaged when the island was hit with a very large storm surge but had been re-built. It looked a bit like a wine barrel with grapes for design. 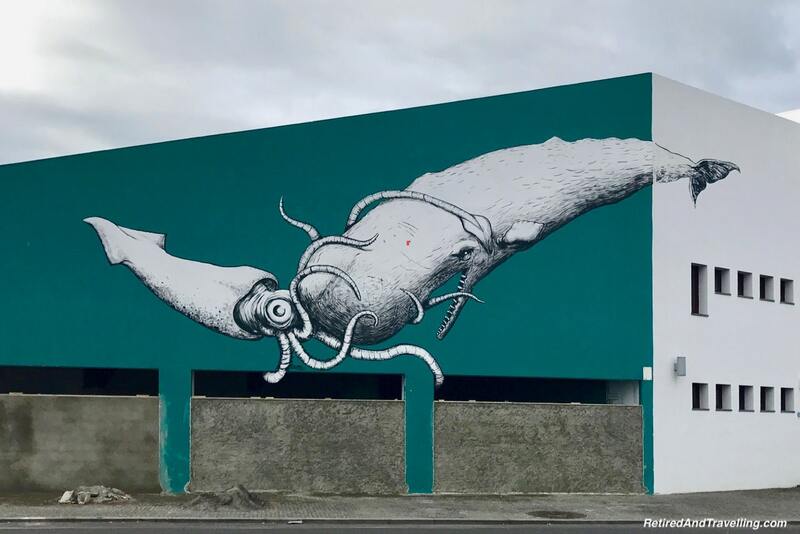 When we walked around by the sea we saw more local art. 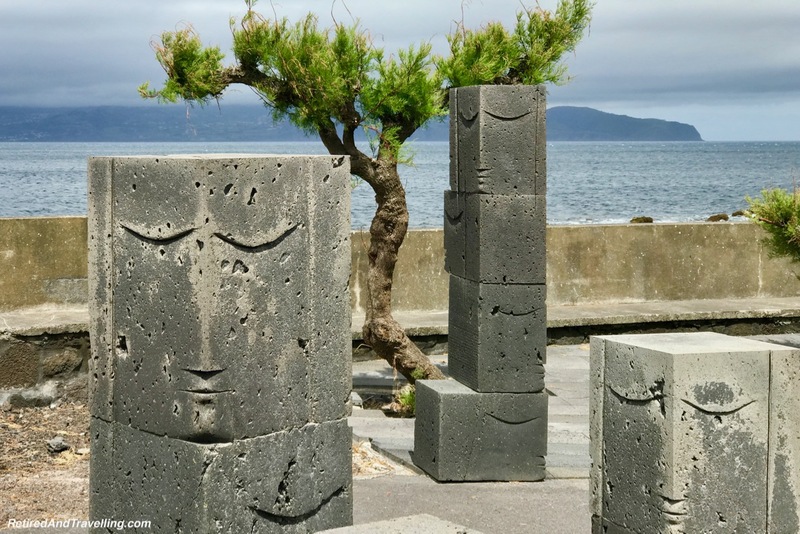 Stone carvings created smiling faces. 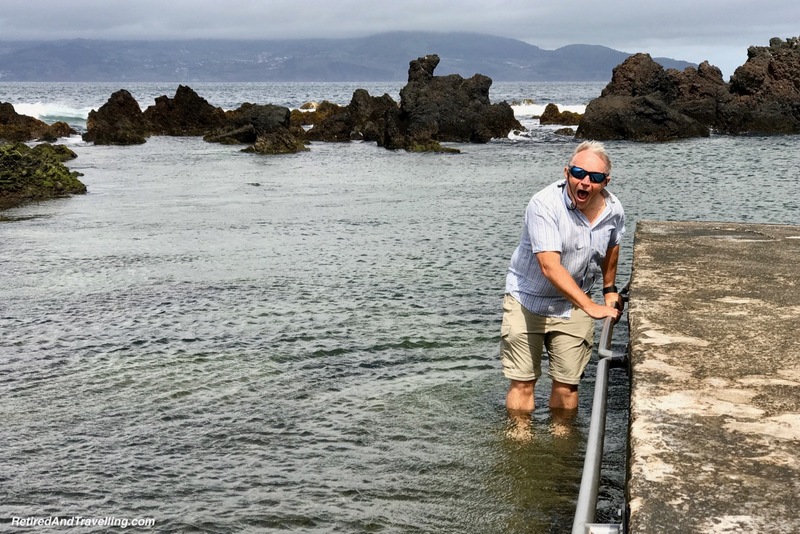 As we found when we travelled the coast in Sao Miguel and again on our tour of Faial, a small swimming area had been created in the rocks. David felt brave and walked in. But he did not get far! The water was after all only about 16℃ (60 ℉). We stayed along the coastline and saw more of the wine fields and small cellars by the road. 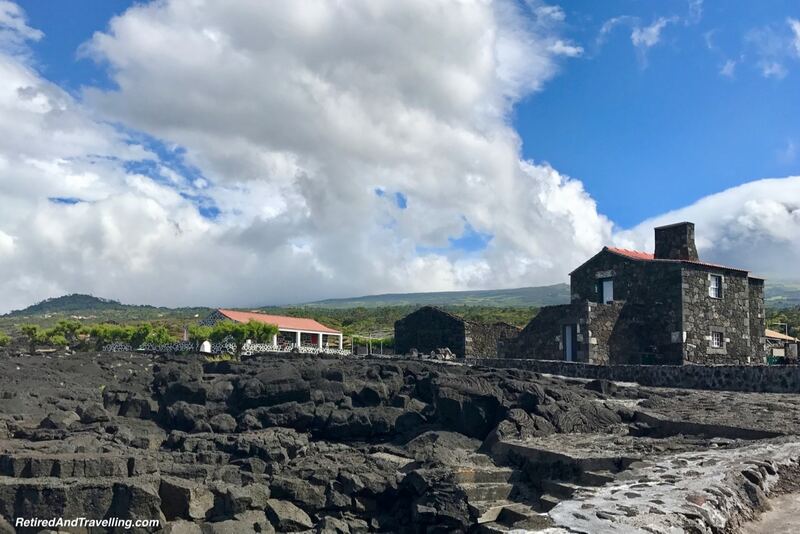 We could not visit Pico and not explore the historical perspective of Pico Island through the burgeoning wine industry! 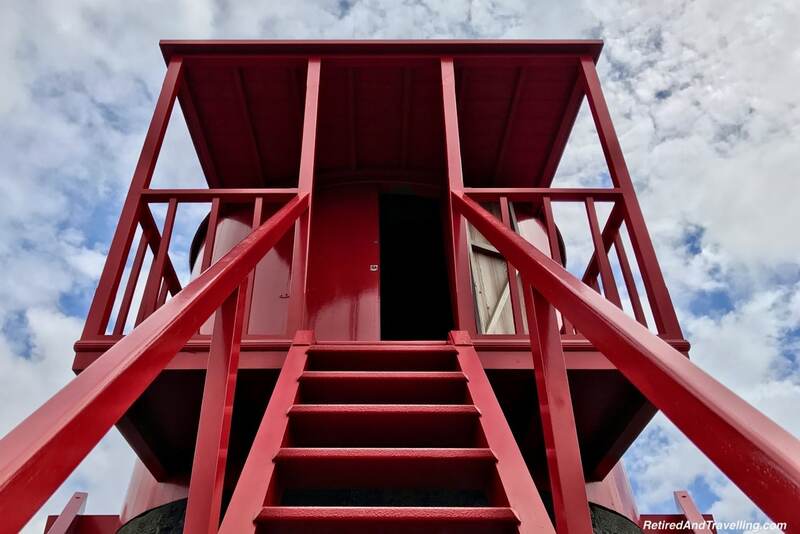 By Criacao Vehla, Pedro turned off on a small path into the wine fields. We stopped at a well-restored windmill to see the wine fields and the windmill. 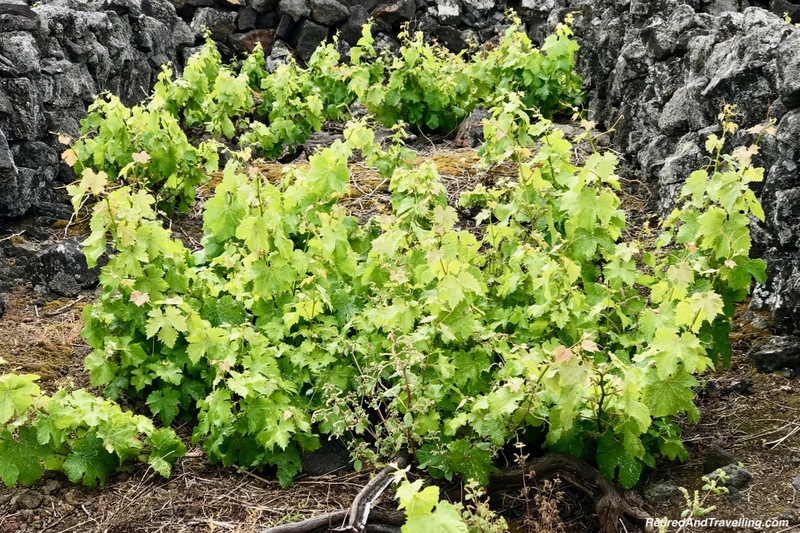 We got a close look at the grape plants within the rock enclosures. It was still very early in the growth cycle and no grapes could be seen. The fields went on for miles. Climbing to the top of the windmill, we went inside. 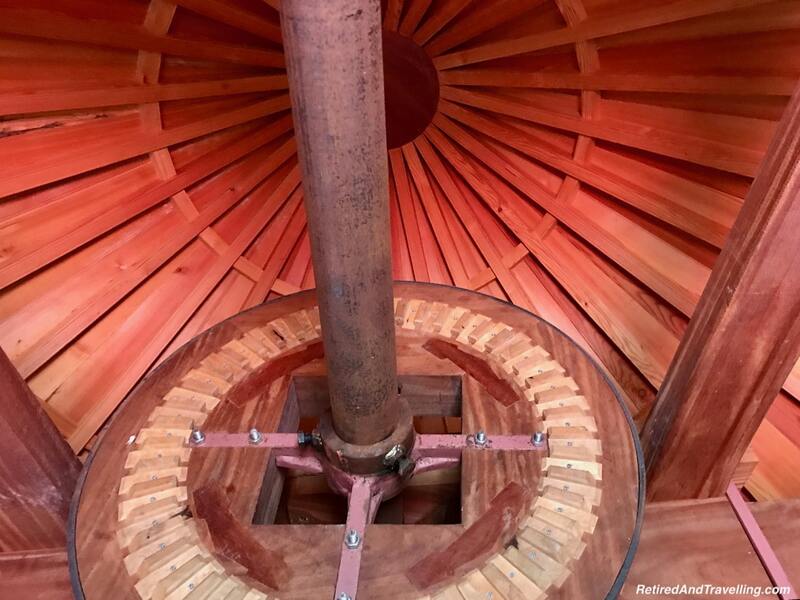 The restored mechanisms and wooden roof were in great shape. We could not determine if it was still ever put to use. From this high vantage point, we looked out over the wine fields. Far off in the distance we could see Faial in the clouds. Pedro continued our tour along the south coast. We continued to see lava flows everywhere. 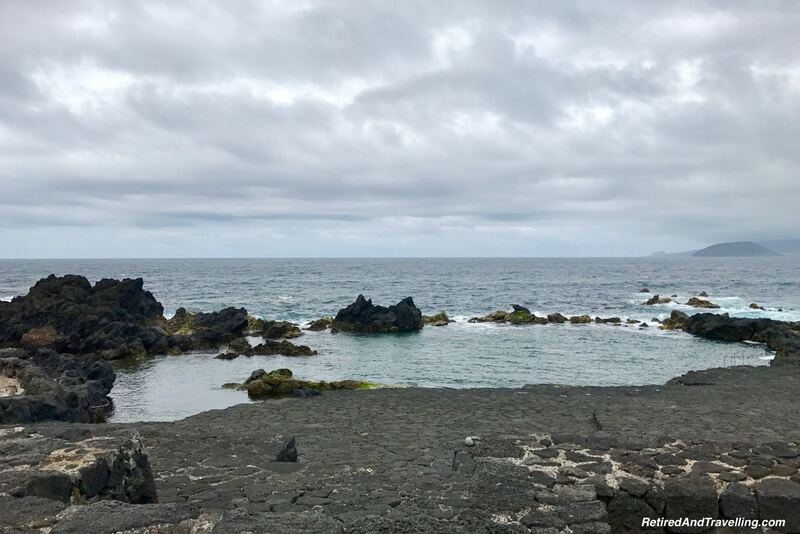 Where the lava fields flattened out, we could see more natural swimming pools. The plots of land within the rock walls started to get bigger. Various different vegetables were planted in the larger gardens (corn, potatoes, cabbage, etc.). Pedro had one business stop to make. We pulled over in the fields around Monte to help Pedro count bats. As part of the research done by the Naturalist Science and Tourism group, data was often collected when their guides were out in the field. David counted for the 10 minutes required for the observation protocol and saw only one bat during this time. There was a lot of work being done to clear wine fields. 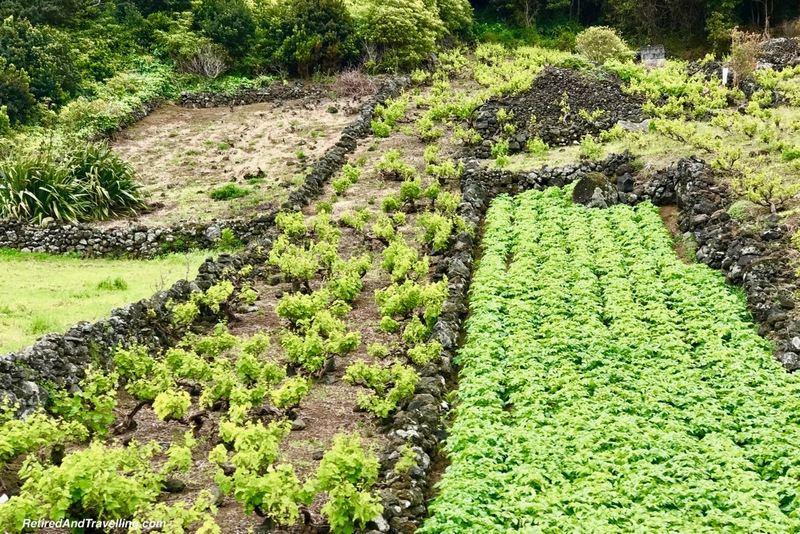 With the popularity of Pico wines increasing, many families had reclaimed old wine fields that were buried by forests. The grapes generally go to co-ops to process and bottle for small growers. Larger companies process their own. A final stop before lunch at Trolha provided us with a view of the pounding surf and more wine fields. We wound our way down to the port area at Prainha Do Galeao. Pedro had arranged for us to have lunch at the small bar cafe. Our lunch had been pre-ordered and plates started to arrive. Green salad to start. 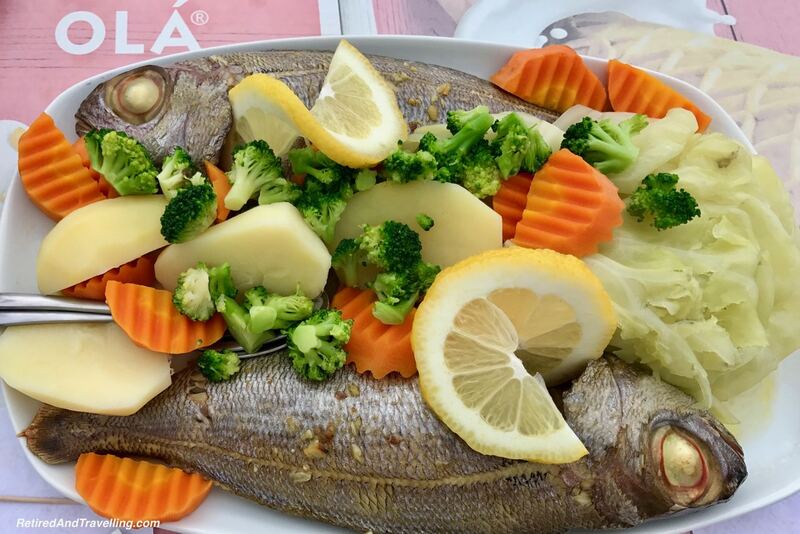 A massive fish plate with two whole sea breams was our main dish, complete with a huge mound of veggies. All was delicious. For dessert we had cake made by the owner’s wife, a strong coffee and the homemade blackberry liqueur that I loved. Coffee continued to be hit and miss. 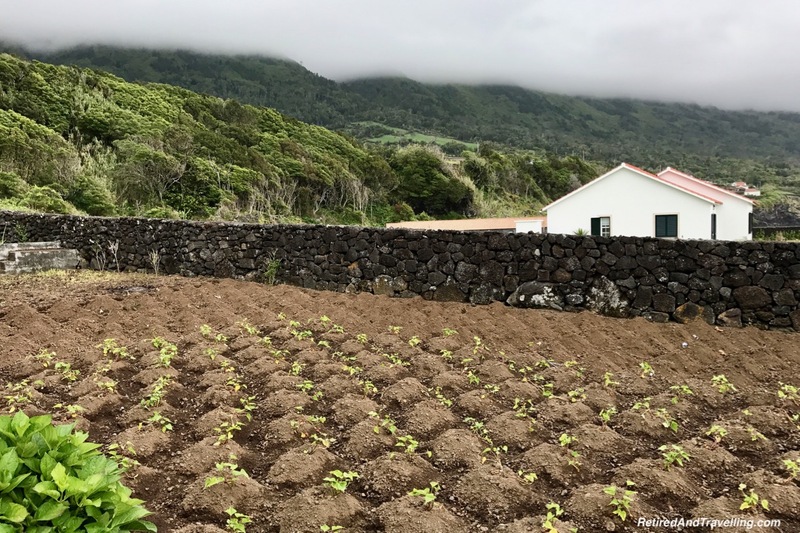 The only island with coffee is Sao Jorge and they keep all their coffee harvest on the island. It was another great local lunch. The owner apologized for the lack of selection in local Pico wines. Too much of the wine was exported from the island. This left little to enjoy when you visited the island. Discussions were in progress to ensure that there was local wine available on the island. Pedro let us do a quick walk around the small port and then herded us to head to our next stop. 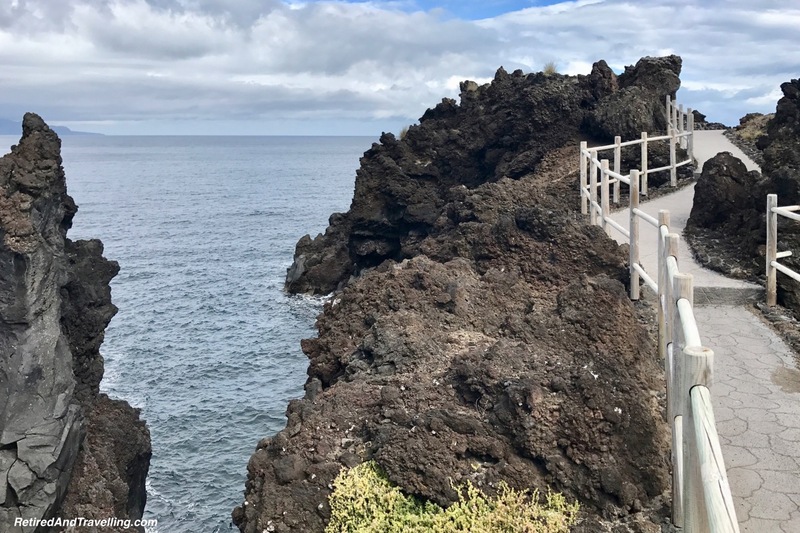 There was still much to see to complete our view of the historical perspective of Pico Island. And we did not want to miss our ferry. 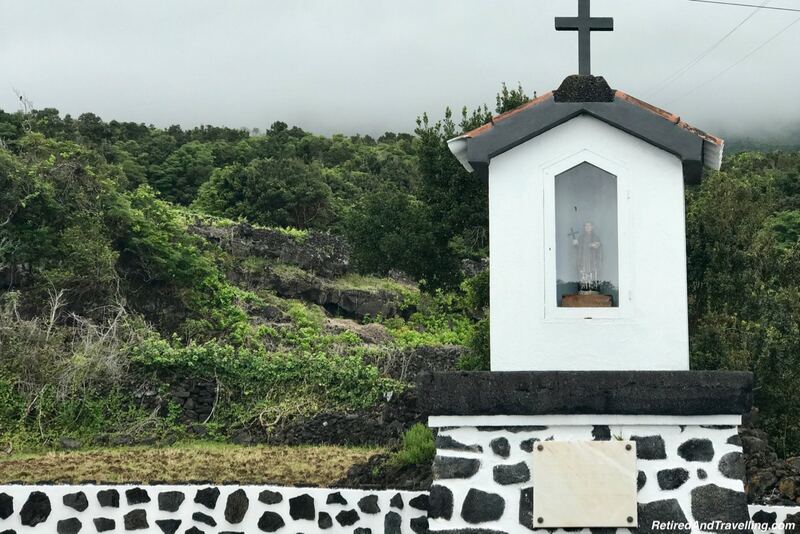 As we drove through the small villages in both Faial and Pico, Pedro pointed out the very small churches of the Holy Spirit. These were opened only once per year. 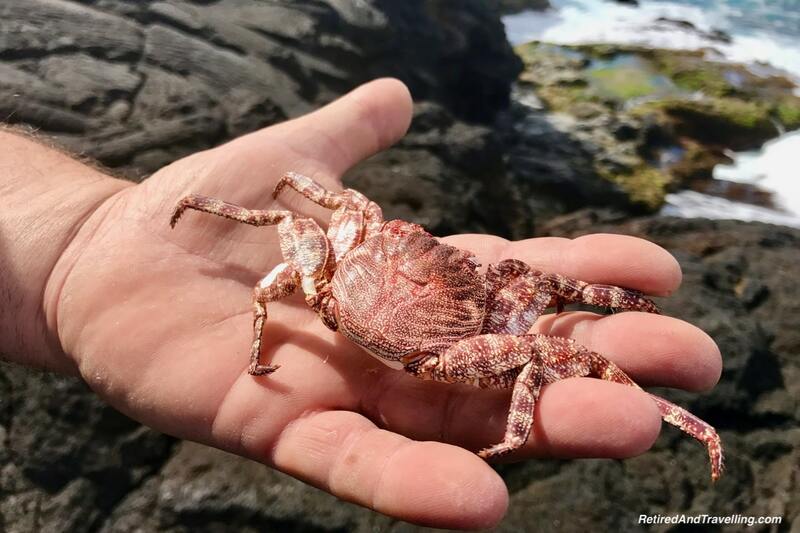 He noted that some of the largest and prettiest were found on Terceira Island. 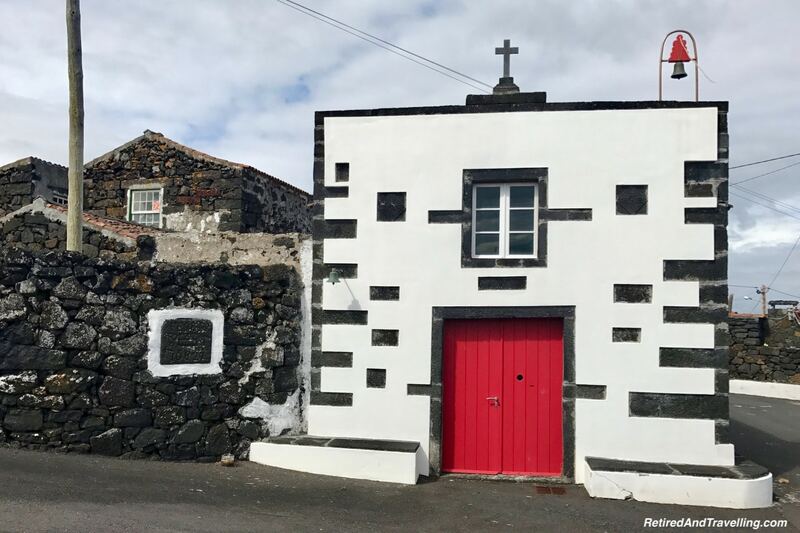 Our trip along the south coast finished at Lages do Pico. 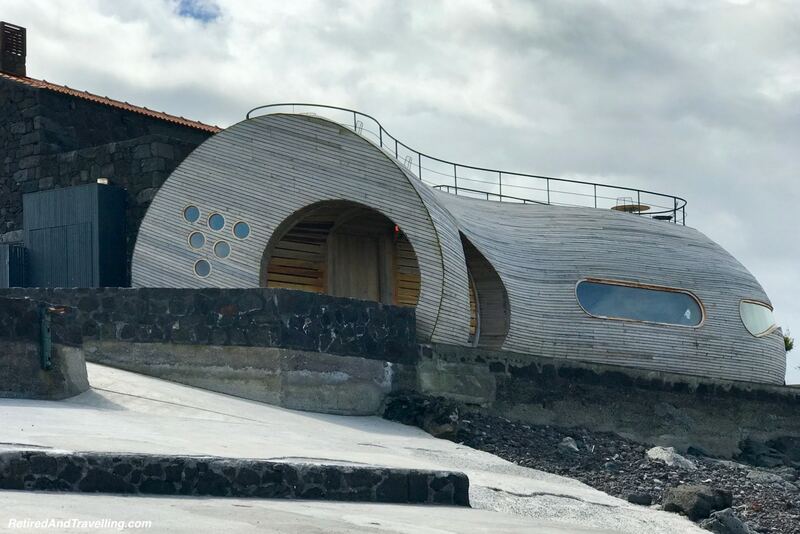 This stop would provide our whaling historical perspective of Pico Island. 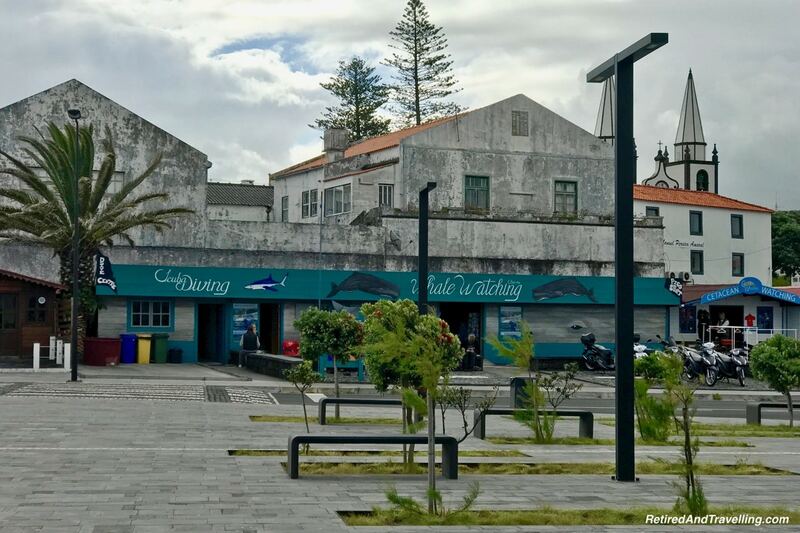 This had been the most important whaling village in the Azores. When the whale hunting business finally closed up in the early 1980’s the new business of whale watching started here. This stop included a list to the Whaling Museum. 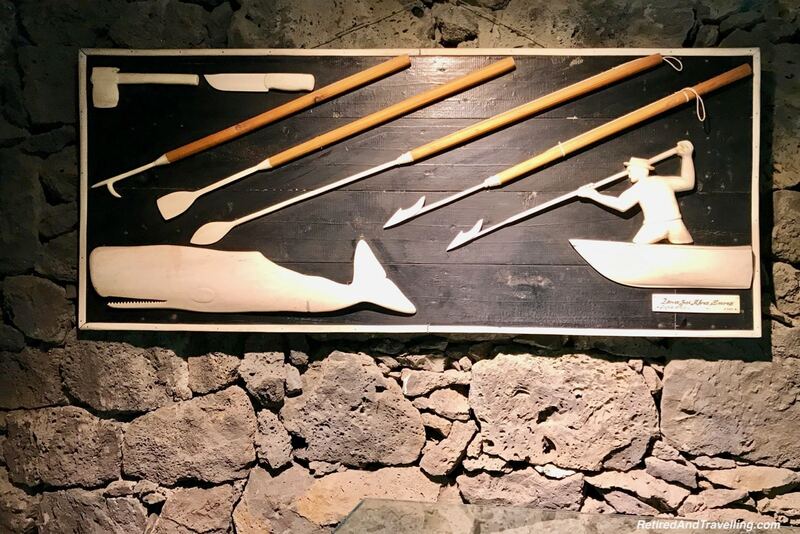 There were good displays that showed all facets of whaling. 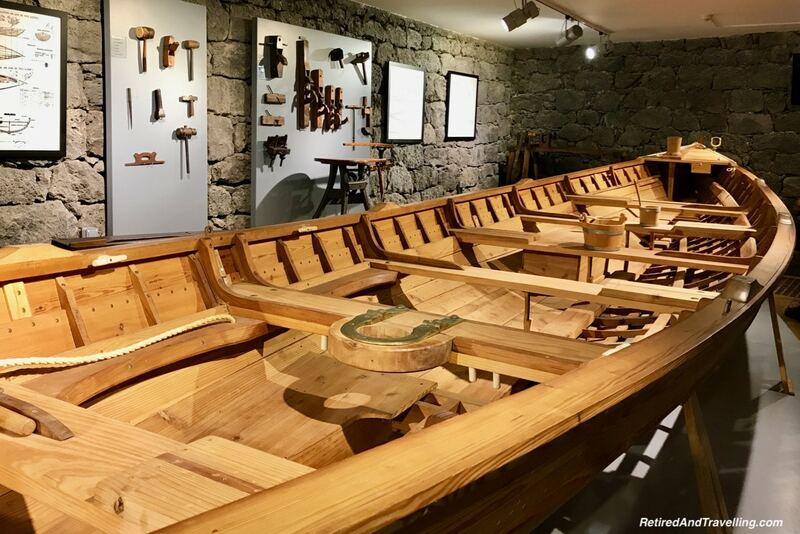 We got information about the typical whaling ships with the triangle sails (Acoriano) and saw a fine example in the museum. These boats are now used for sailing competitions. 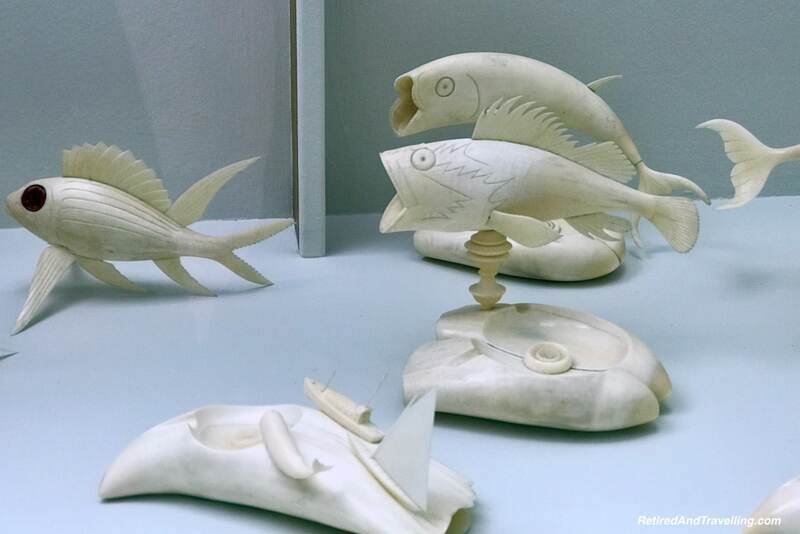 There was also a broad display of beautiful whale bone art. It was interesting how many things were actually made with the bone. 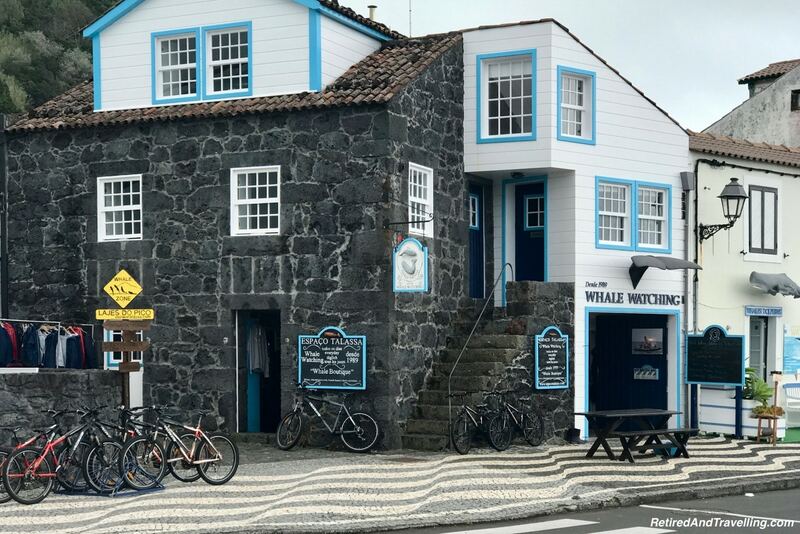 The volcano museum at Capelinhos on Faial has provided a great introduction to the volcanic history of the Azores. 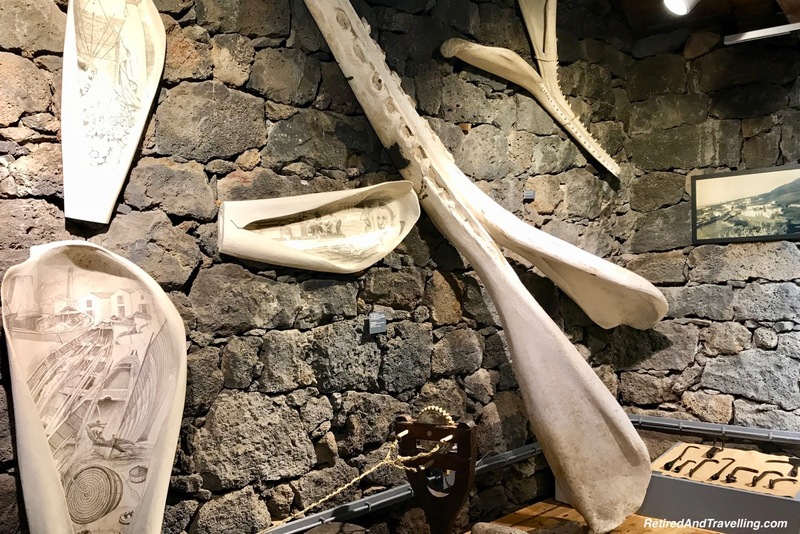 We certainly got a comprehensive view of the whaling historical perspective of Pico Island at this museum! It was time to head back to the north side of the island to complete our circle. Fog totally claimed the top of Pico mountain. As we watched we saw it creep down the slope. 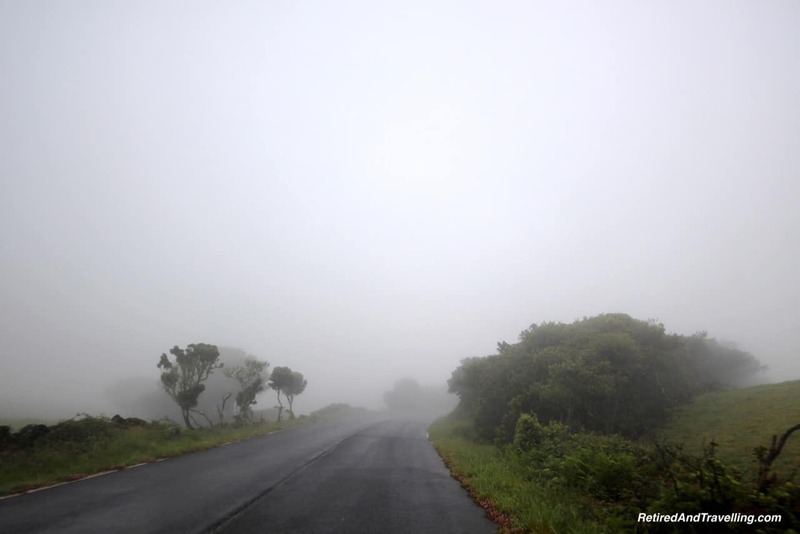 Pedro debated using the coast road or going up and over the mountain in the fog. In the end we opted for the high route. It was not long before we drove right into the fog. I am sure there must have been great views down to the shores and up to the mountain on a clear day. But not on this day! We came down out of the clouds at Sao Roque Do Pico. Ahead of us was the quiet commercial port. 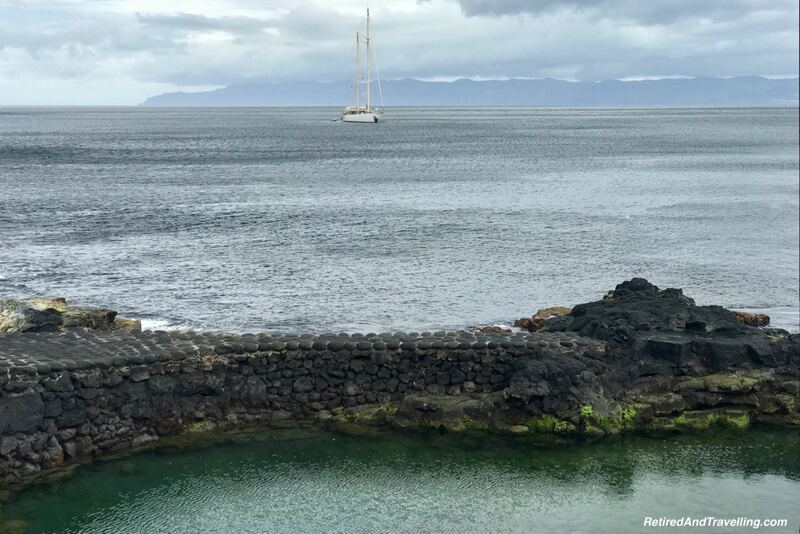 There was little port activity on a Saturday but we did see a sailing ship with Sao Jorge in the background. 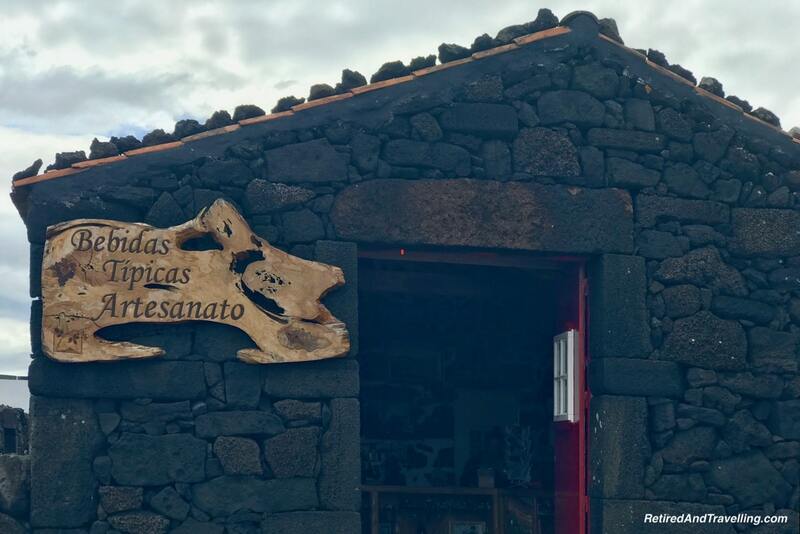 Our final stop to look at lava was at Cabrito. 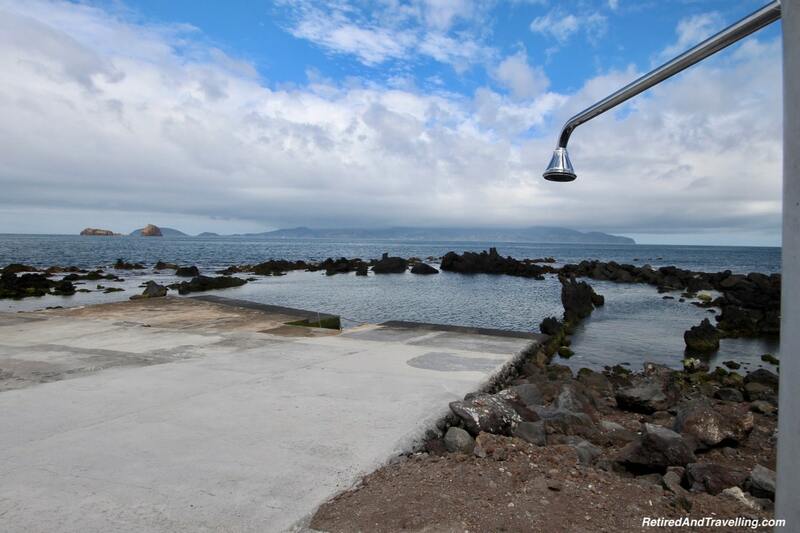 This would complete our volcanic historical perspective of Pico Island! As soon as we approached the dark rock we could see the chord lava by the water. 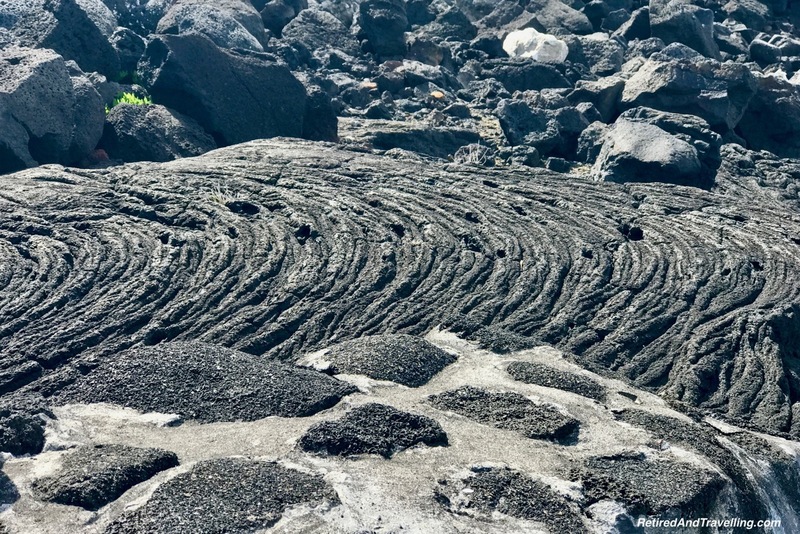 It was easy to see the frozen flow of the lava in places and the distinct chords in others. When we looked close, we saw crystals in the lava (pyroxene and olivene). Pedro even found a shed crab shell. 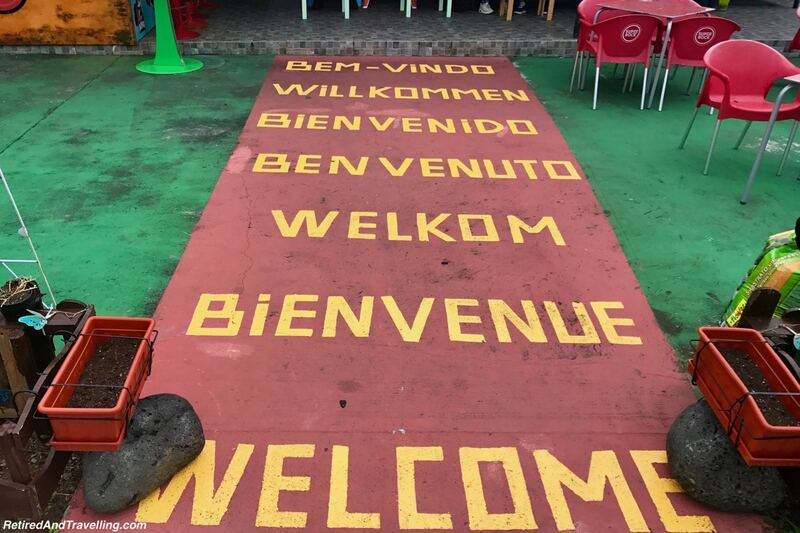 Pedro provided us with a great tour of Pico Island. We learned a lot about many aspects of the historical perspective of Pico. 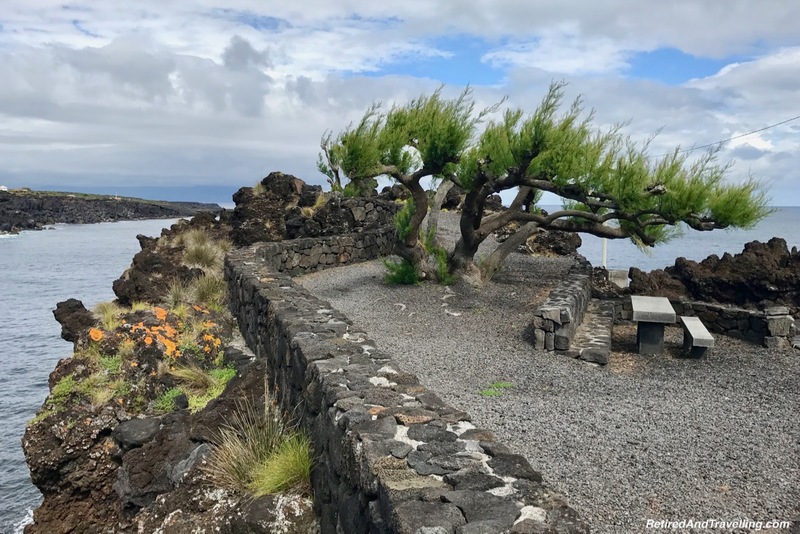 Lava flows, wine fields, endemic plants, local architecture and the whaling industry filled our day. 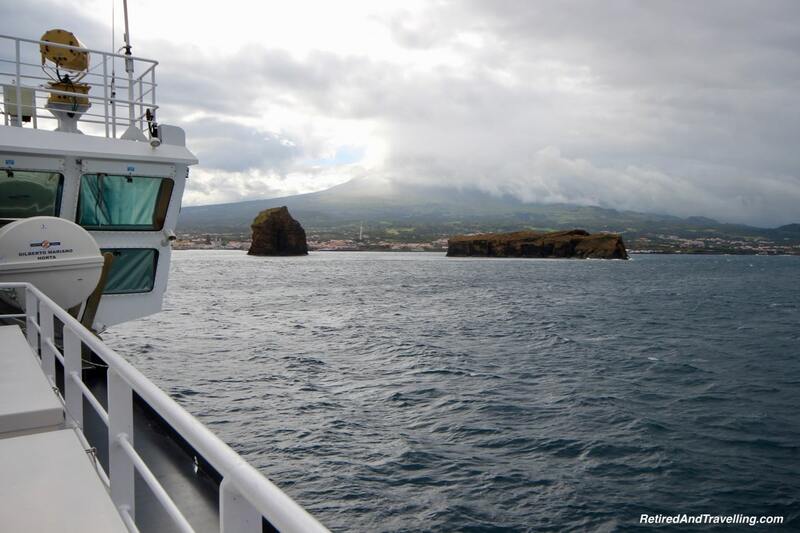 The ferry back to Faial Island was full. We took our seat on the upper deck and Pedro pulled out his end of day treat. We toasted again with Naturalist cookies and the yummy homemade blackberry liqueur. 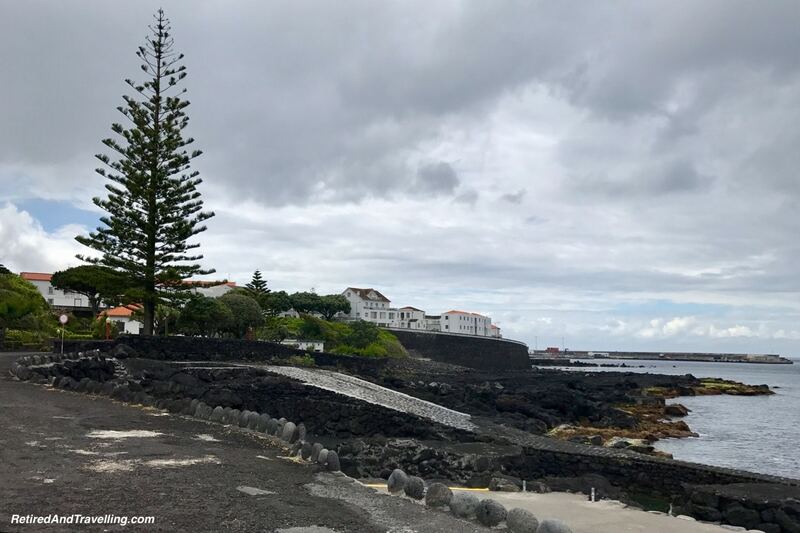 The weather cleared a little in Faial while we were away. We could see the town of Horta spread up into the hills as we approached the shore. 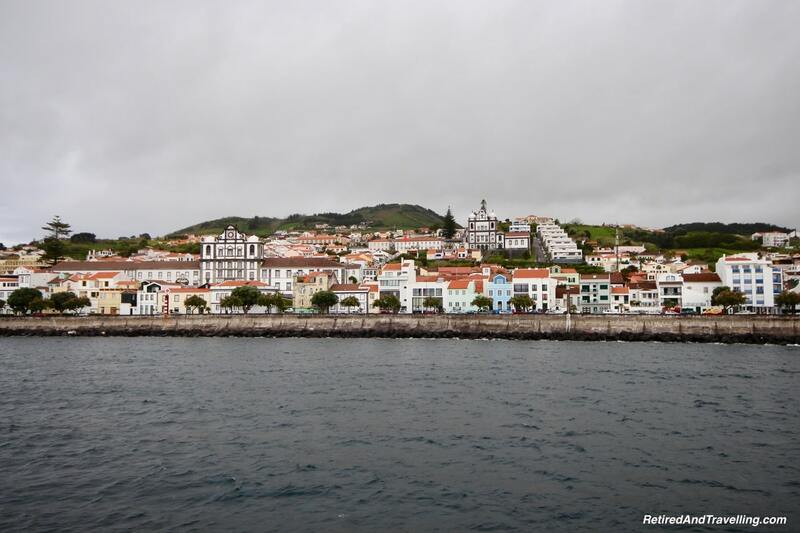 We started our tour of the Azores on Sao Miguel Island. This was our introduction to some of the unique features we would see in the Azores. 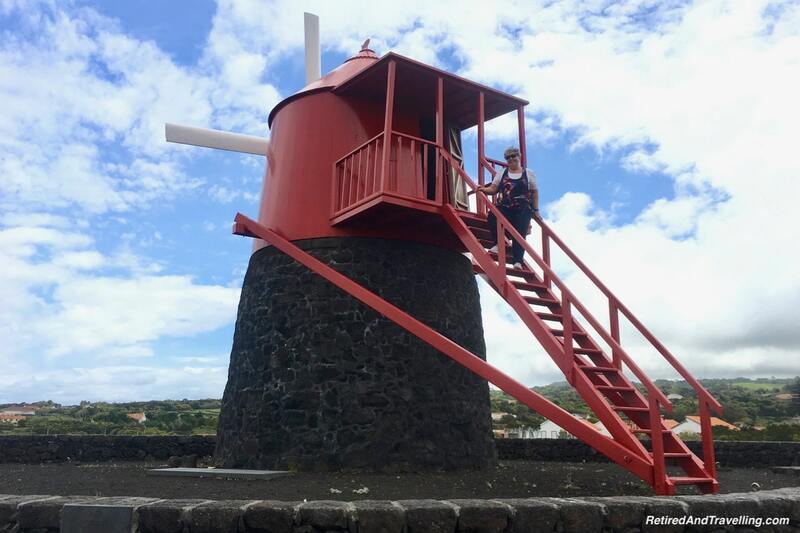 Our full day tour of Faial added to our insight. 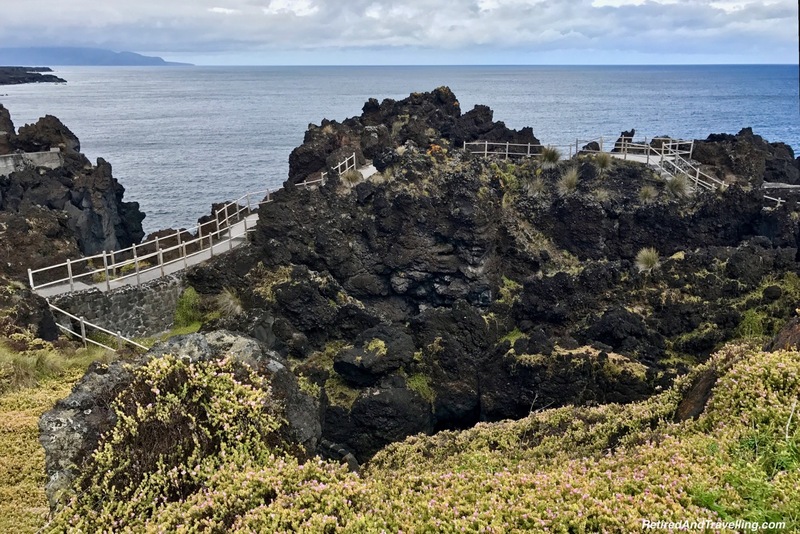 This final tour wrapped up the historical perspective of Pico Island and our visit to the Azores. 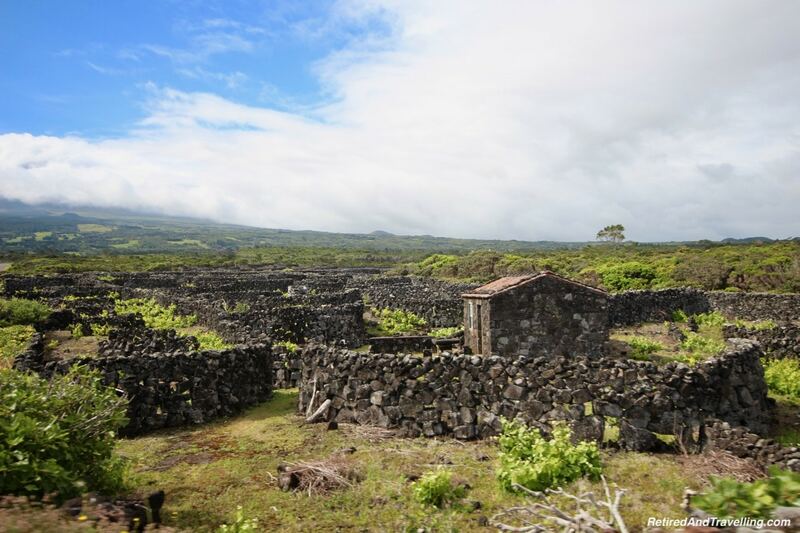 Are you interested in the historical perspective of Pico Island? 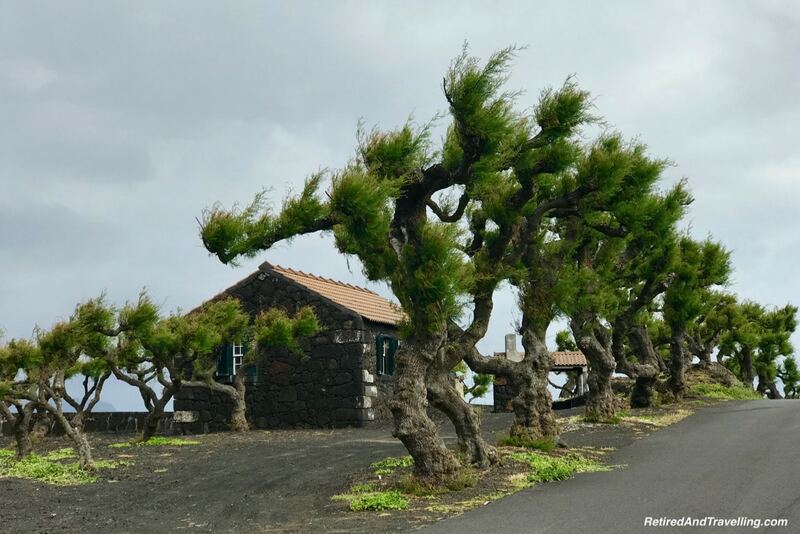 Do volcanos, agriculture, architecture, wine or whaling intrigue you more? How did you find out about Pedro and in general, what are your strategies for finding a good guide, especially in the smaller port towns? What a gorgeous place full of beautiful contrasts and history! Beautiful article, thanks for sharing!